Rosetta's lander Philae has been identified in OSIRIS narrow-angle camera images taken on 2 September 2016 from a distance of 2.7 km. The image scale is about 5 cm/pixel. Philae's 1 m-wide body and two of its three legs can be seen extended from the body. The images also provide proof of Philae's orientation. 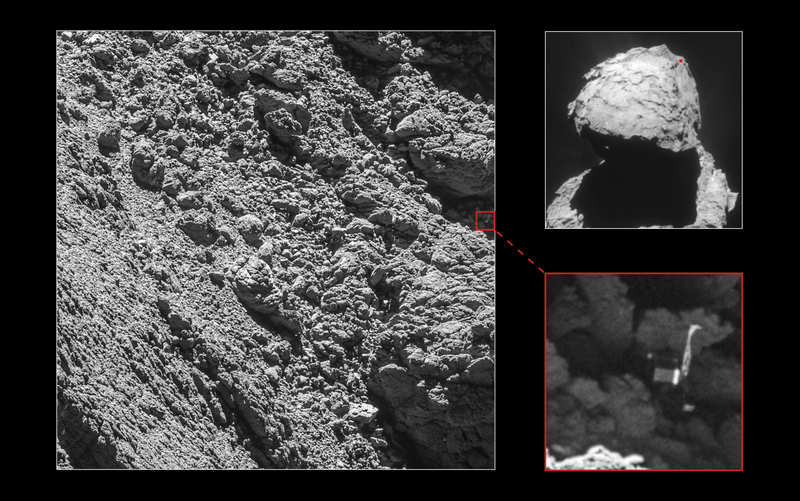 A Rosetta Navigation Camera image taken on 16 April 2015 is shown at top right for context, with the approximate location of Philae on the small lobe of Comet Churyumov-Gerasimenko marked.